As of today, there are 5 Public Living Rich Couponing Workshops available to attend. You can RSVP using the contact information provided on the link below. 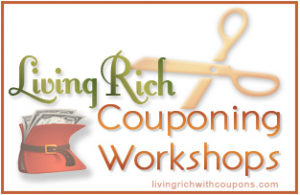 Reminder: If you are interested in hosting your own Living Rich Couponing Workshop you should do so as soon as possible as space is filling up quickly!